The Michiana Stormwater Partnership is an educational group represented by nine local entities in the Michiana Area. Our mission is to educate our community on the importance of good environmental stewardship of all of our rivers and streams and provide the community with information, resources, and opportunities to help them develop or enhance their own efforts for the common good. Currently stormwater runoff is not treated before entering our rivers and streams. We must do our part to prevent pollution from entering our waterways and protect aquatic life. 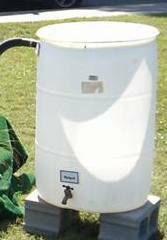 A typical 1/2 inch rainfall can completely fill a 50 gallon rainbarrel. Capturing rainwater in a rainbarrel allows you to reduce the amount of stormwater runoff during a rain event, while providing a free source of water to use on your lawn or garden on a drier day when you really need it. The Michiana Stormwater Partnership has recently installed signs near all major water courses in St. Joseph County, City of South Bend, and City of Mishawaka. The signs inform passerby's of the waterway name and also have a slogan "A Resource Worth Protecting" to help remind everyone that our rivers and streams of Michiana are important resources that we must keep clean and free of pollutants. Below is a sign at the Juniper Road crossing of Juday Creek. Below you will find the "Blue is the new Green" YouTube video sponsored by the Michiana Stormwater Partnership and other various groups. This video helps with reviewing the Do's and Don'ts of basic stormwater pollution prevention practices that should be implemented by everyone in their home, in their yard, and when they are out and about. Please take a moment to watch the video and learn to do the right things to help protect our environment, especially focusing on ways to keep our waterways clean.